Otaku (Jam Hsiao) and his roommate Mr. Cheap (Da Peng) are known as the ultimate geeks of their university. However, like any normal guy, their goal is to fall in love with their girls of their dreams. To get close to his goddess Mei (Agyness Zhang), Mr. Cheap pretends to be a spoiled rich kid, appearing everywhere she goes. Meanwhile, the introverted Otaku tries to create a chance to talk to class beauty Ling (Maggie Jiang) by running into her in the hallway, only to have his plan fail awkwardly. “青春就像卫生纸 看着挺多得 用着用着就不够了” Youth is like toilet paper, it looked like there’s a lot, but as you use them, it became too little/ not enough. The very first quote got me searching for them online immediately, and don’t be surprise to see more interesting to come in the film. Comedy film lovers will most probably love this classic comedy where the geeks meet the babes. The most hilarious (yet very relatable ) things happen when four nerds with their very own unique characteristics try their very best to chase the woman of their dreams. Xiao Ying (Kuan Ji Wen) is an overweight nerd who goes around professing his love for every girl, hoping one of them will be interested in him. He is especially mesmerized by Ah Mei(Agnes Zhang) and will try different hilarious ways to catch her attention. Cheapo who is super thrifty and stingy, and will go all out to save money by borrowing necessities from room-mates, packing food back from clubs and parties. Gao Gao Di (Cai Wei Jia) the “gangster” who knows how to sweet talk with girls. And of course, the story mainly revolve around A-Zhai (Jam Hsiao) and his crush with school belle Ya Ling who is the girlfriend of a flirty guy from rich family. There are many classic (though some will say cliché)scenes where audience can easily relate to, such as how girlfriends are indecisive when it comes to meal times, how nerds always think the rich and handsome guys in school are always the one ending up with pretty girlfriends. This film is basically speaking out for the nerds and showing the difficulty they meet when chasing girls. I’ve grown up watching the director 朱延平 Kevin Chu’s films (like 笑林小子 Shaolin Popeye starring 林志颖 Jimmy Lin and 郝邵文 Steven Hao Shao Wen; 新乌龙院 Messy Temple starring 张卫健 Dicky Cheung Wei Jian; 漫画王 Comic King starring 吴奇隆 Nicky Wu Qi Long and 吴孟达 Ng Man Tat), so this film is totally his style. I love the individual performance of each and every actor, as they all do have unique and memorable characteristics. As this is one of Jam Hsiao’s first leading film, I won’t mark him down too much, after all, he looks nerdy as he should. If you don’t like the slapstick comedy, this might not be for you. My Geeky Nerdy Buddies is more of a quantity over quality kind of film as it consists of many different experiences, but they might not exactly touch your heart. My favourite part were the scenes with Ya Ling’s mother (Lin Mei Xiu) and A-Zhai’s dad (Chen Bo Zheng), who are familiar faces in Taiwan dramas and films. I actually cried when she showed her concern for her daughter (I’m not going to tell you why and what happened!) in her own way (She’s an uneducated mother). However, I’m an emotional person, so not everyone will be that easily touched! This is a recommended film for anyone who doesn’t wish to watch any horror films this Halloween! The female lead Jiang Shu Ying (江疏影) also acted in Vicki Zhao’s first directorial film: So Young (致我们终将逝去的青春). She was praised by the director that even her toes could act! Jam Hsiao (萧敬腾) was named the Rain God, as every time he turns up, the rain will become bigger. Jame Hsiao and Jiang Shu Ying shared their first on-screen kiss together and instead of chewing gum before that, they had fried chicken cutlet to destress. Xie Na who acted as a girl from Sichuan was labelled as the One-Take Queen. She managed to finish her three-day worth of scenes within 2 days. Check out My Geeky Nerdy Buddies (大宅男／大宅们)Official Facebook Page! 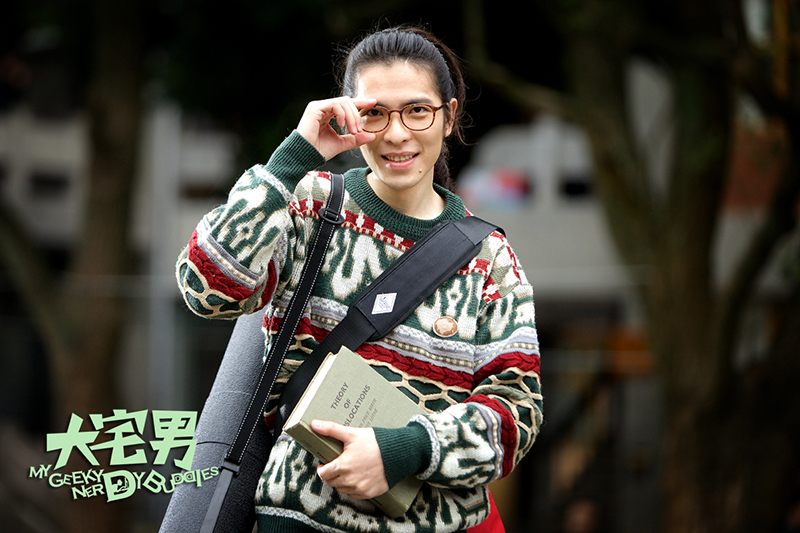 My Geeky Nerdy Buddies (大宅男／大宅们) is out in cinemas on 30 October 2014. Romantic comedy always the best movie to watch. Hopefully it’s with happy ending! Romcoms are always hilarious. Wish I could see this. And oh, chicken cutlets before kissing? Sort of like J Law’s tuna before kissing Liam. Haha. LOL, I love the movie poster! What a hoot. This seems like it would be a great show to see, just to relax and escape reality for a bit..
Haha this is gonna be a great and fun watch for me. Hmmmm I am a fan of these movie genres thank! Even here in the Philippines, a lot of movies are done about nerds/geeks falling for the prettiest or very good looking man of their campus. Somehow, it not only entertains teenagers but I believe it boosts the confidence of the geeks/nerds that they deserve respect to and that they can do something to have that. They are somehow taught, through the movie scenes, how to best handle situations like seeing their crush or how they could win her, etc. Movie seems to be interesting, thanks for the preview.. I like the quote on the tissue paper. It’s funny yet it has a deep insight. That’s how I see this one as it can be funny but it can really give you a good insight and think. I like the storyline – it seems very casual, light, and funny. I’ll make sure to check it out the stores where I get my DVDs in the nearer future … we should have this title here in my country pretty soon. Oh I’m sorry, I got confused with the characters and assumed they were “Korean”. No offense meant! I’ve never seen a Korean movie. I’m not into slapstick comedy but sometimes, there are those that I enjoy. This looks hilarious ! Assuming it won’t reach our shores 🙁 Maybe it will be released on DVD or through a streaming service. This movie is so interesting. I love romantic comedies! I wish we have that movie here though.